Later this year, scientists will put a 40,000-pound chemical laser in the belly of a gunship flying at 300 mph and take aim at targets as far away as five miles. And we’re not talking aluminum cans. 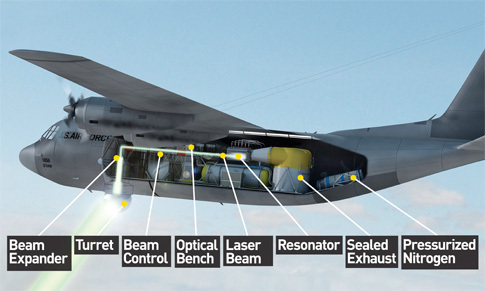 Boeing’s new Advanced Tactical Laser will cook trucks, tanks, radio stations—the kinds of things hit with missiles and rockets today. Whereas conventional projectiles can lose sight of their target and be shot down or deflected, the ATL moves at the speed of light and can strike several targets in rapid succession. When the C-130 flies within targeting range (up to five miles away), the gunner aims using a rotating video camera mounted beneath the fuselage. The computer locks onto the object to continually track it. A second crew member precisely adjusts the laser beam’s strength—higher power to disable vehicles, lower power to knock out, say, a small power generator. The gunner hits “fire,” and the computer takes over from there. In a fraction of a second, chlorine gas mixes with hydrogen peroxide. The resulting chemical reaction creates highly energetic oxygen molecules. Pressurized nitrogen pushes the oxygen through a fine mist of iodine, transferring the oxygen’s energy to iodine molecules, which shed it in the form of intense light. The optical resonator bounces this light between mirrors, forcing more iodine molecules to cough up their photons, further increasing the laser beam’s intensity. From there, the light travels through a sealed pipe above the weapon’s crew station and into a chamber called the optical bench. There, sensors determine the beam’s quality, while mechanically controlled mirrors compensate for movement of the airplane, vibration and atmospheric conditions. Precise airflow regulates the chamber’s temperature and humidity, which helps keep the beam strong. A kind of reverse telescope called the beam expander inside a retractable, swiveling pod called the turret widens the beam to 20 inches and aims it. The laser’s computer determines the distance to the target and adjusts the beam so it condenses into a focused point at just the right spot. Tracking computers help make microscopic adjustments to compensate for both the airplane’s and the target’s movement. A burst of a few seconds’ duration will burn a several-inch-wide hole in whatever it hits. This has been an amazing adventure. The Martian rover Spirit is now in the race of its life. The rolling robot is trying to reach an outpost to spend the winter, but it keeps getting bogged down in soft sand on Mars. Earth scientists hope that Spirit can reach a slope on the northern edge of the unusual feature dubbed Home Plate, before the end of this month when northern winter will be phasing in on Mars. Reaching this slope will likely allow the rover to tilt enough toward the Sun to create a needed increase in the efficiency of its energy-absorbing solar panels. This map shows the path of Spirit from July 2004 until just last month. The system, which is FDA approved, is being used in all of Loyola’s operating rooms, its labor and delivery rooms, interventional cardiology laboratories in which surgical procedures are performed and its ambulatory surgery sites. As the technology grows, Loyola plans to use it to keep track of all medical equipment used during a procedure. Every year, in the United States about 1,500 people have surgical objects accidentally left inside them after surgery, according to medical studies. This technology is very familiar to anyone who has ever used a grocery checkout system. Each sponge has a unique bar code affixed to it that is scanned by a high-tech device to obtain a count. Before a procedure begins, the identification number of the patient and the badge of the surgical team member maintaining the count are scanned into the counter. As an added safety feature, the bar code is heat sealed into the sponge to eliminate any danger of it becoming detached during a procedure. The counter has a color screen that keeps a running count of the sponges used. It provides visual and audio cues when a sponge is scanned in, scanned out and if one is missing or is being counted twice. Because each bar code is unique, the system will not allow a sponge to be accidentally counted twice. Some really interesting visions of the future from 50 years ago. collection of the most inspiring & hard-to-find retro-futuristic graphics. Again, just how many of these new machines will Queen by Divine Right of Marriage and Its My Turn Hillary and her universal health care bureaucrats approve? It would only benefit the rich, after all. A new scanner has been unveiled which can produce 3D body images of unprecedented clarity while reducing radiation by as much as 80%. The new 256-slice CT machine takes large numbers of X-ray pictures, and combines them using computer technology to produce the final detailed images. It also generates images in a fraction of the time of other scanners: a full body scan takes less than a minute. Because the images are 3D they can be rotated and viewed from different directions – giving doctors the greatest possible help in looking for signs of abnormalities or disease. The scan is much quicker than current technology, as the machine’s X-ray emitting gantry – the giant ring-shaped part that surrounds the patient – can rotate four times in a single second – 22% faster than current systems.